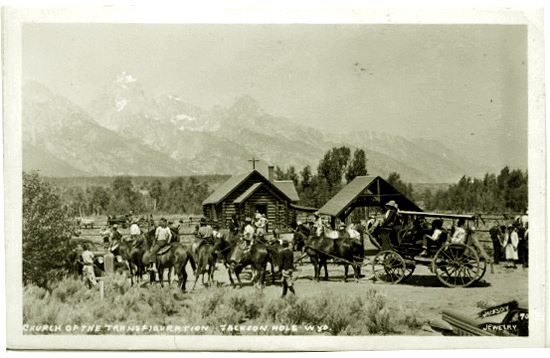 This Page: Grand Tetons continued, Menor's Ferry. 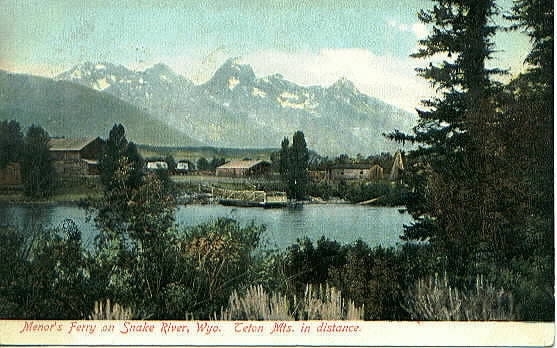 William Dean "Bill" Menor arrived in the Jackson's Hole in 1892 from Sheridan. Later in 1905, he was joined by his younger brother Holiday H. Menor who had previously prospected in Montana. Both had grown up in Winfield, Kansas. Each established homesteads, Bill on the west side of the river and Holiday on the east side. Bill proved up his claim in 1908 and Holiday in 1919. 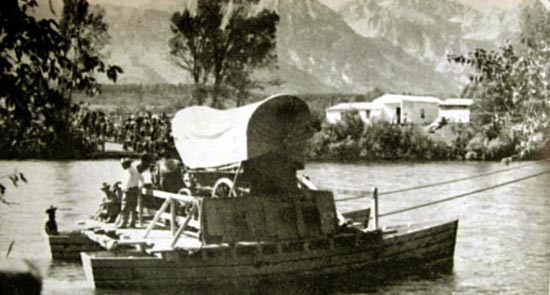 Bill was the first settler on the west side of the Snake River. In 1894, Bill Menor established a cable ferry across the river charging fifty cents for a team and twenty-five cents for a horse and rider. During the winters when the ferry had to be laid up, Menor rigged up a small platform suspended on the cable on which passengers could haul themselves over the river before it froze over. In later years at the beginning of winter, settlers from the area would construct a temporary bridge which would then be dismantled in the spring when the ferry went back into operation. Menor also maintained a store and would provide overnight lodging and meals for only the ferry fare for those who were caught when the river was unsafe for the little ferry to cross. He insisted, howver that they get up early and be on time for meals. Bill Menor's Cabins. National Archives. In 1918, Bill Menor sold the ferry to Maud Noble. She increased the tolls, $1.00 for an automobile with Wyoming plates, $2.00 for out-of-state cars. Menor's Ferry, approx. 1925. Photo by Harrison "Hank" Crandall. Bill and Holiday Menor left the valley and moved to California where they died within a year of each other. 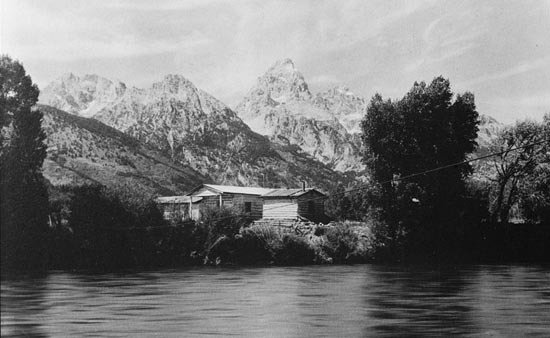 Next to Bill's hospital bed was placed a crude painting of the Tetons. 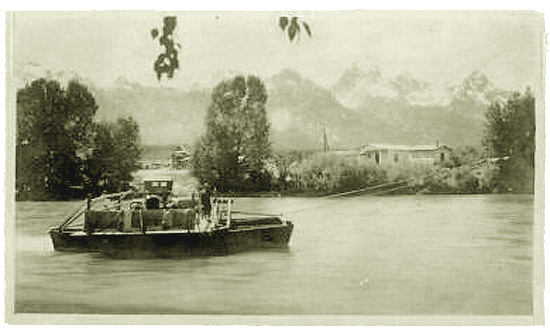 In 1926, a bridge was built across the Snake River, and the little ferry went out of business. A year later, Maud sold out to the Rockefeller interests discussed below. 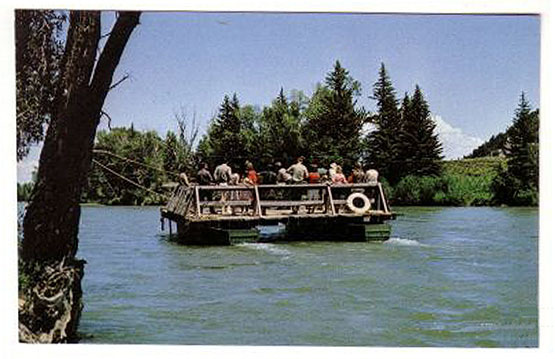 The present ferry at Moose is a reconstruction of the ferry. Also located at Moose is the Episcopal Chapel of the Transfiguration constructed in 1925. A window over the alter frames the Grand Tetons. Services are conducted in the summer. Chapel of the Transfiguration, 1930's. Next Page: Gros Ventre Landslide.